The Disney World Free Dining offer has just been released for Disney Visa card holders. This free dining promotion is expected to be released to the general public on May 7, 2014. For 2014, the Disney World Free Dining Plan is being offered for stays 8/31/14 – 10/3/14, 10/26/14 – 11/1/14, 11/9/14 – 11/20/14 and 12/12/14 – 12/23/14. The offer excludes the Villas at Grand Floridian, Little Mermaid rooms at Art of Animation Resort, All-Star Movies, Port Orleans French Quarter and Riverside, campsites and 3-bedroom villas. As usual, the Value resorts get the Quick Service Dining Plan for free, and the Moderates, Deluxe, and Deluxe Villas receive the regular Dining plan. Time to make those ADRs!!! Will you be taking advantage of this offer??? Find all the details at Mousesavers! More Free Wi-Fi at Disney World! On August, 1, 2012, Inside the Magic announced that Magic Kingdom is now providing free Wi-Fi access covering the entire park. Additionally, they received official word that Disney plans to provide free Wi-Fi at all four theme parks and the Downtown Disney area by early 2013. How will free wi-fi in the parks be used? Most likely, this is part a larger plan by Disney, related to the NextGen FastPass system currently under development. I have not been too involved on the speculation as to all the details of the NextGen system, but if you are interested, the Inside the Magic article linked above has links to the announcement and some other information. This new free wi-fi offering at Magic Kingdom may also be related to the recently announced “My Disney Experience” app for iPhone and Android devices. This will be an upgrade to the current “Disney Mobile Magic” app that we wrote about back in 2010. Again, I am not getting too involved in the speculation surrounding this release, but it sounds like it will be an enhanced version of the Mobile Magic app, possibly integrated in some way with the NextGen system. Only time will tell. I do know that data coverage, at least with Verizon, can be spotty in the parks, so hopefully the wi-fi coverage will be more reliable, making the “My Disney Experience” app more enjoyable to use. This is not to say that the in park wi-fi will be restricted to Disney content. You will have full Internet access using this connection. So tweet, like, +1, and share on all your favorite social networking sites till your heart’s content! I don’t know about how quickly others consume their data plan, but I don’t usually have an issue with overages. Fortunately, I am still on the Verizon unlimited plan, but I still use less than the standard 2GB. Regardless, I am sure there are those of you that could see a savings with this free wi-fi announcement. What do you think of the availability of free wi-fi in the parks. Will it be a distraction from touring the parks? Will we see more mindless zombies staring at their phones while bumping into the crowds of people? Will the free connectivity make it possible for you to get away from work while still being connected? Let us know! We recently had the pleasure of eating at the California Grill for the first time. We will get to a review of the whole experience in an upcoming post, but we wanted to mention a new first course that our server said was added to the menu May 30th. The Squash Blossom “Oscar” with Petite Crab Cakes, Farmer Jones’ Asparagus, and Sauce Bearnaise. Yes, to some I am sure this sounds strange, especially when you realize you will be eating a whole squash blossom, including the flower. 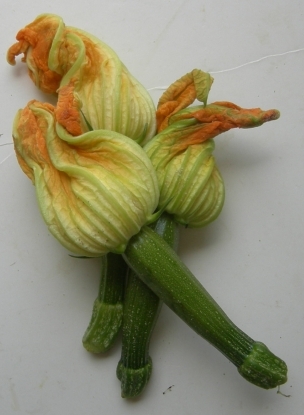 The squash blossom is stuffed with provolone, asiago, and parmesan cheeses and tempura battered. The proportions of the three cheeses was perfect, with no one flavor overwhelming another, and the tempura was light and crispy. The Crab Cakes were made with fresh chives, tarragon, and lemon, and just enough mayonaise to hold the crab together. Our server made sure to mention that there was NOT any bread crumb filler in these crab cakes. They were lightly pan fried and served over the bearnaise, instead of smothered in it. Since there was two of everything, this was a perfect first course for the two of us to share. We were equally impressed with how wonderful this selection was and it is always nice to see Disney maintaining the menus with unique and seasonal offerings. Speaking of seasonal, I imagine that squash blossoms don’t stay in season for long, so if this sounds like something you want to try don’t wait too long! You now have until December 17, 2011 to take advantage of the 2012 Disney FREE DINING promotion when you book your 4 night/5 day Magic Your Way vacation package for select arrival dates January thru March of 2012. Book a trip with a Moderate, Deluxe or Villa resort and get a free Disney Dining Plan or book at a value resort for the free Disney Quick-Service Dining Plan. The arrival dates have not changed, they are January 8th thru the 12th, January 21st thru February 2nd, February 11th thru the 16th, March 3rd thru the 8th and March 24th thru the 29th. We personally think the free dining deal is THE BEST Disney deal out there! And what better way to get rid of the winter doldrums than a trip to sunny Florida and the happiest place on earth! For more info check the Disney Web Site. Select Disney World fans are receiving the opportunity to book free dining by using a special pin code that they receive by email. This offer is valid for arrivals most nights 4/23/11-8/13/2011. Book by 4/30/2011. Value and moderate resort bookings include the quick service plan for free, Deluxe and Villa resort packages receive the standard dining plan. No word yet on if this will become available to the general public. We can only hope! Update! Free Dining Announced for 2011!